CUPE members in B.C.’s community health sector continue to struggle with challenges such as low wages and high workload, but—with a new provincial government committed to a strong public health care system and renewed efforts toward coordinated bargaining—there is cautious optimism heading into the coming round of contract negotiations, delegates to a CUPE health care bargaining conference found this week. 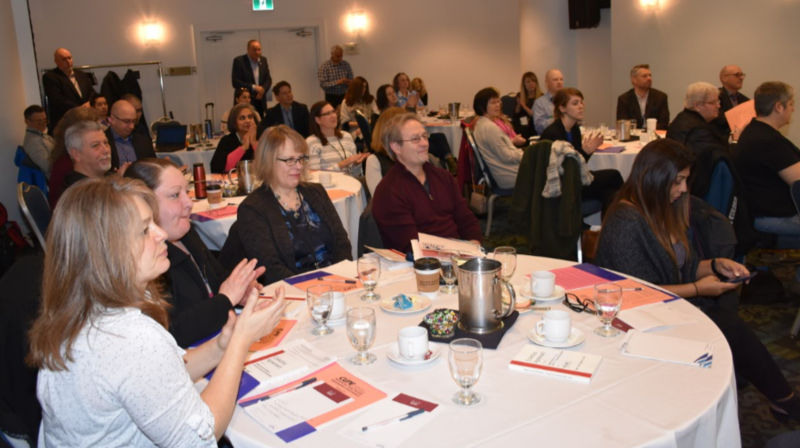 The February 6 conference, hosted by CUPE’s Health Care Presidents’ Council, was aimed at setting bargaining priorities and electing bargaining representatives for CUPE members in both the Community Bargaining Association (CBA) and the Health Science Professionals Bargaining Association (HSPBA). In her welcoming remarks, Assistant Regional Director Meena Brisard reminded delegates of a recently adopted CUPE National bargaining policy that calls for no concessions while suggesting ways to address precarious work and violence in the workplace. She also noted that CUPE has the staff resources to get the best possible collective agreements for its members. CUPE BC President Paul Faoro noted that the bargaining landscape in B.C.—a grim place after 16 years of anti-union rule by the BC Liberals—is looking brighter these days. For example, he cited the government’s recent appointment of former Hospital Employees’ Union assistant secretary-business manager Jacquie de Aguayo as permanent chair of the BC Labour Relations Board. “A sister who comes from the HEU—I can’t tell you how much of a difference that makes, in terms of changing the culture of how labour relations are done in this province,” said Faoro. While criticizing the newly elected BC Liberal Party leader (“Andrew Wilkinson was responsible for driving down wages and cutting health expenditures. The new saviour of British Columbia? Give me a break.”), and looking forward to the BC NDP’s first full budget later this month, Faoro reminded delegates that Premier John Horgan cannot undo 16 years of BC Liberal damage overnight—especially as the leader of a fragile minority government. Guest speakers Edith MacHattie and Nathanel Lowe of the BC Health Coalition shared highlights from the Coalition’s work over the past year while stressing the need for renewed health care funding in B.C. “We’re here together because we want to build better health communities,” said Lowe, a BCHC campaigner and organizer, noting that health workers play a pivotal role in addressing issues such as the opioid crisis and growing inequality (for example, how indigenous people have worse health outcomes than non-indigenous people, and how seniors are often isolated without proper care). Lowe and MacHattie praised the Horgan government for cutting MSP premiums in half. Over the last decade and a half, they said, the BC Liberals allowed MSP to become a greater source of revenue for the province than natural resources while offering greater tax cuts for the wealthy (between 2001-2010 amounting to $3.4 billion in lost revenue). They also noted some encouraging developments in health care reform. There’s been a notable shift, they said, to a more preventative, less acute care- or crisis-based reactive approach that is more team-based and multi-disciplinary. The BCHC recently launched a primary health care working group comprised of health policy researchers, leaders within grassroots community organizations, and local activists. “It’s been inspiring to talk with local communities who are talking about improving community-based care,” said MacHattie, noting the recent formation of the BC Rural Health Care Network in Princeton. Remaining challenges include a federal funding formula for health care that’s tied to the economy (the Trudeau Liberals, are continuing the Harper government funding formula that’s based on the GDP or 3 per cent each year—whichever is higher) and the constant threat of two‑tiered, privatized health care (on April 9, the Coalition will be returning to BC Supreme Court to continue its legal challenge of Brian Day’s private Cambie clinic). Also at the conference, CUPE Researcher Sarah St. John presented the results of a recent workload and bargaining survey that gave delegates plenty to think about. For members in both the CBA and HSPBA, the survey results showed that the quality of health services is suffering due to excessive workload and understaffing, and that burnout is systemic. The survey responses included several suggestions for addressing burnout. Delegates also heard from BCGEU staff member Brent Camilleri and HSA staff member and former CUPE activist Dennis Blatchford, who provided updates on joint health benefits trusts for the CBA and HSPBA, respectively. And CUPE Health Coordinator Chris Losito provided an overview of the bargaining environment. For the afternoon session, members broke up into their CBA and HSPBA groupings to set bargaining priorities and elect their bargaining team representatives. For conference photos see the gallery.